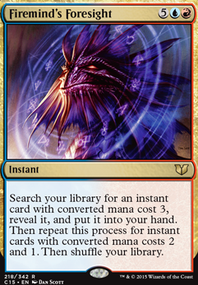 Something to remember is that every red deck you come across will probably have Electrickery in the sideboard, so you will need to answer that in some way. It's worth having some more Relentless Rats in either the main or sideboard. Worth considering Dash Hopes for decks which don't get defenses up early as a 5 life swing is not something they can deal with. Both Night's Whisper and Sign in Blood are decent common draw spells for you, with Sign giving the added benefit of being a shock against your opponent. I really like the idea behind this deck. How are you planning on handling something like Electrickery , Echoing Decay , or Echoing Truth ? The rats also trade with tokens or elves which means you can't attack with anything other than your gnawers without impacting your Gary plan. Dealing with flyers will also be challenging. Maybe it's worth adding more removal at the expense of the draw from Dusk Legion Zealot ? It might be worth thinking about some cards like Ruin Rat or Rancid Rats for the deathtouch to deal with Anglers. Also, Rancid Rats gives you some evasion which may help in getting monarch back in the event that you lose it. I think Gnat Miser would be an interesting inclusion if you feel like you want more on the hand disruption package. Rotting Rats is a symmetric effect but it has unearth to give an extra activation of its ETB and given your card draw you can use that to your advantage, or before you toss our Gary you can unearth them to pump up your devotion. Tapped Out just ate a hella-long response I had been working on. Very frustrating. 1) Definitely need to find a way to speed up/slow your opponent down. It's not Budget, but Blood Moon and a little shuffling of your land base might serve that purpose well. 2) Need to find a way to survive common board-sweepers like Pyroclasm , Anger of the Gods , Electrickery , Bonfire of the Damned , etc. without having to rebuild from scratch. The best options that come to my mind right now are in green, but I'm sure someone else will have ideas to offer up. 3) White opens up all of the best sideboard cards (like Stony Silence , Rest in Peace (not for you) and Leyline of Sanctity . With all the graveyard effects in the format right now, you should definitely put a set Relic of Progenitus in your sideboard as well. 4) Oketra's Monument definitely seems to have a place in this deck. 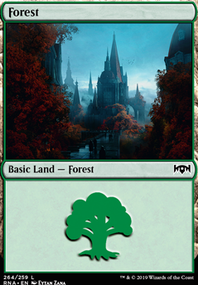 5) I absolutely hate it when people come in and start giving advice that's based on completely reworking the entire deck rather than trying to keep with the framework I'm clearly trying to establish, but it occurs to me that this deck might benefit more from green than red. It'll ramp up your mana base and offer broader protections like Heroic Defiance and Beast Within . Just a thought. I see what you are trying to do, and this deck should be reinforced with Whipflare , Mizzium Mortars , Electrickery and Pyroclasm in order to super buff your CMDR and have him deal lethal commander damage. 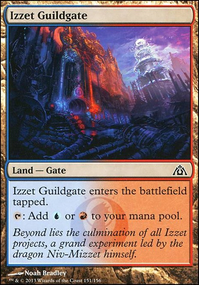 I think Devastating Dreams in here can ensure that no one will have any lands to respond to your giant CMDR. I highly recommend that you include more shroud/hexproof: Whispersilk Cloak , Lightning Greaves , Swiftfoot Boots and Glaring Spotlight . Maybe Akroan Horse has a place here? One last thing, mana rocks will be your best friend in this deck: Thran Dynamo , Rakdos Signet , Commander's Sphere and Talisman of Indulgence (there are many more you could choose from]. I know when first starting EDH, it is tempting to include every rare in your deck that you have. That shoudn't be the case here, things like Vanquisher's Banner Triskaidekaphobia , and Extractor Demon have little to no place here. Good luck on this deck manifestation! Quick obvs: Even though you're running a low CMC build, still too low on land. Should be at 35+ minimum. 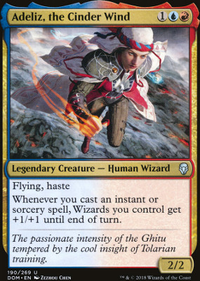 Not a fan of any of the enchantments, except Legion's Landing Flip. Sanguine Bond should probably be Exquisite Blood if you're going for a hoard type aggro strat. Token creators do not work with Edgar... I'd replace them with actual value vamps like Kalitas, Traitor of Ghet or something like that. The light discard package feels out of place/unnecessary...? Dazzling Reflection , Firestorm and Massive Raid are the only Instants in the list I'd play. Not a fan of any of the Artifacts. You're in 3 colors and have next to 0 color fixing. 1/3 of your creature package can be removed by a single damage (ie: Electrickery ) Liliana of the Dark Realms seems narrow in a tri-color build. I still think you have too many suboptimal cards. Lightning Bolt is a strict upgrade over Shock , Soul's Fire / Reckless Abandon is worse than Fling and Seething Song / Mark of Mutiny does nothing. 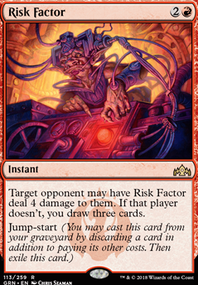 Arc Runner is also terrible because it can be easily blocked and it becomes 3 mana do nothing. A good rule to abide by is to make sure your deck does one thing well, and only that one thing. Your deck right now is a bit all over the place, and there is a glaring flaw where you have no real way to refill your hand. 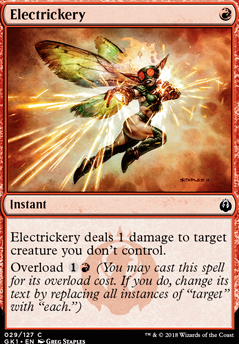 Your sideboard is also weak to White Weenie, which is a popular deck right now so Electrickery is compulsory. I also don't see a situation where Perilous Myr can be boarded in. As a rule, sideboard is where you run hate cards, and tech against hate. 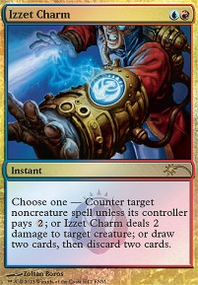 Try to look up the Izzet Blitz list. You definitely need more card draw just in case your first barrage doesn't kill. 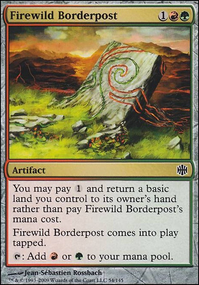 Consider also running some dual lands such as Swiftwater Cliffs . Cycle lands are a good idea but Lonely Sandbar is better than Desert of the Mindful .